Its Not Lego is a blog about Lego clones, fake lego, bootleg lego, and alternate block brands, such as Lepin (Nuogao), Bela, Xingbao, Decool, Enlighten, and Sheng Yuan, just to name a few. We hope you find the pictures and reviews informative and entertaining. Hi and welcome back to Its-Not-Lego. You might know this set as Lego 41340 Friendship House but did you know that this Friends building has been copied by not less than five different bootleg brick brands? 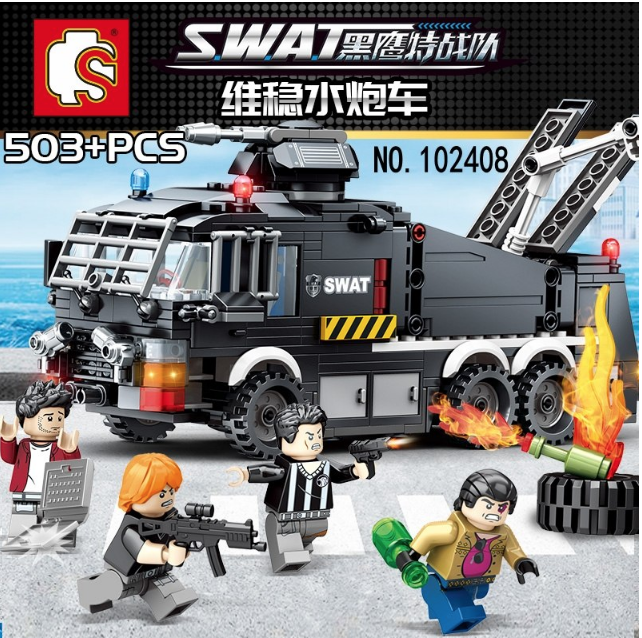 A quick search for Friendship House on Aliexpress reveals that this set can be found as Lepin 01063, Bela 10859, Lele 37077 and Sheng Yuan SY1006. The version I got is from an unknown brand called DG, set number 1034. Here's the instruction manual that I got with the Friendship House set. 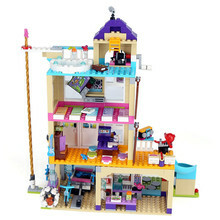 It says DG Girls Club with the set number 1034 with 730 pieces. The set variation that I got doesn't have the roll up door nor the bicycle and tool cart. That alternate set has 808 pieces. Here's a shot of the back of the manual. There are twelve un-numbered bags in the set, a sticker sheet, 3 Friends style minifigs and 2 Friends style pets. I emptied all the parts from the bags and then re-sorted them by colours for fun. I put the yellow, brown and red pieces together. Lime green and dark green. The pink, lavender, and purple bricks. Minifigs, clear pieces and minor accessories. The Friendship House and Tree with swing. A closer look at the Tree and working swing. There's some flowers that are supposed to be added to the leaves, but I didn't bother with those or the stickers. There's a balcony that sits over the carport. I think I was supposed to get a microphone but couldn't find that part. I'm not sure why they put an alarm bell on the building. Maybe it serves as a smoke alarm if something starts burning on the barbeque grill. It's odd that there are glass panels for the smaller windows but none for the larger windows. Not sure if this is only on this 730 piece set or not. The hair piece for one of the minifigs was so gross, that I decided not to display it. Maybe the Friendship house is supposed to be a fire department? That would explain the pole that runs the entire height of the building. I believe that's supposed to be a hamster wheel near the bottom? Would probably be better suited in the Friends Pet Hospital set. There's sleeping for five on the third floor. And a dining table on the second floor with seating for five as well. There's supposed to be a winch that lowers but I never attached the rope. I think the set should have included a car since they have a carport/garage built into the house. The barbeque patio has two sunbeds and access to the slide. There are ladders to the third floor and rooftop only. The set designer should have added another ladder behind the slide to get to the second floor. Oops, I forgot to take a picture of the kitchen on the main floor. As with all my bootleg Friends sets, I don't keep them around. I buy them cheap and use them for parts fodder. That's why I don't bother applying the stickers or putting the final details on the Friendship House. The minifigs and bricks that I can't use, such as the turquoise, pink, purple and lavender parts are given to my friends kids. The remainder of the parts will be incorporated into future modular buildings for my Its-Not-Lego town. I estimate that I can reuse about 60 to 70% of the set. 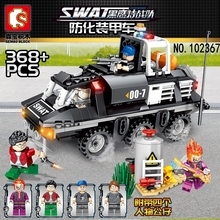 Model number(s): Lepin 01063, Bela 10859, Lele 37077 and Sheng Yuan SY1006, DG 1034. Thanks for looking, bye for now! Hi again and welcome back to Its-Not-Lego. Here's a new model we haven't seen before. 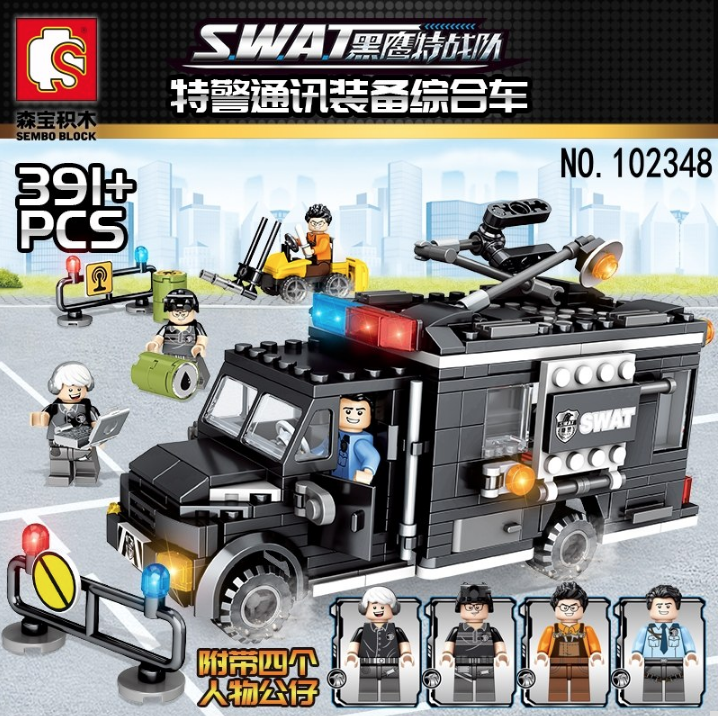 It's the SWAT Water Cannon Truck by Sembo Blocks. 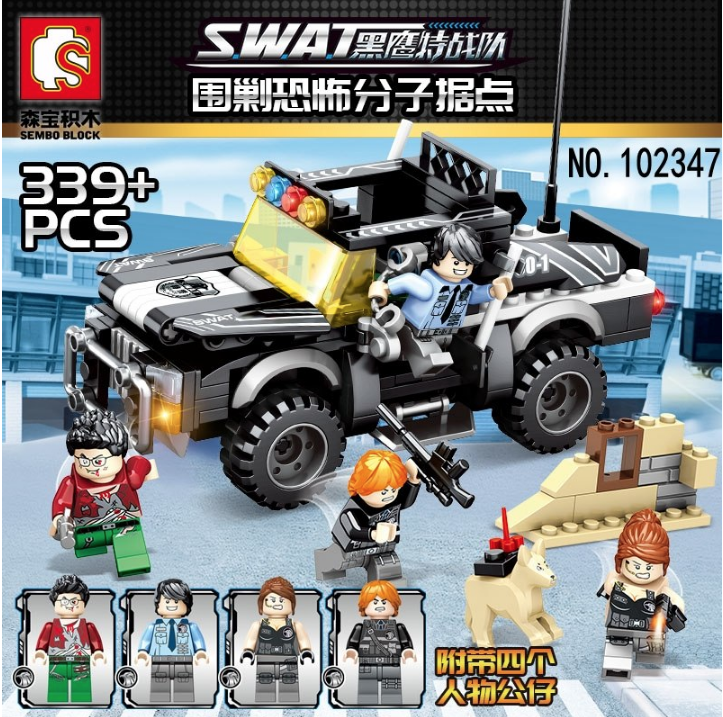 The set number is 102408 and is part of the Sembo Black Hawk series of military style back ops vehicles. Below are a few of the other vehicles found in the Sembo Black Hawk series. Sembo multipage instruction booklet, stickers and some firearms. The back of the manual showing the trucks unique play features which I'll review later. The Sembo Swat Water Cannon truck building set is made up of 503 pieces, over 12 bags of parts. The bags of parts aren't sorted or organized in any fashion, so you have to rip all the bags open to find the right parts as you are building the set. It also doesn't help that the majority of the parts are black in colour. Let's take a closer look at the four minifigures that come with the Water Cannon truck. This is how they look after assembly. There are 2 SWAT team members and 2 guys with questionable intent. The SWAT guys have a black hawk logo emblazoned on their shirts. Here's the backside printing on the Lego style minifigures. No confusion here on who are the SWAT guys. Just a side shot of the figures. Bonus, you get heads with dual faces on each of the minifigures. Here they are with their passive faces. Of special note is that one of the SWAT minifigures has an interesting 2 piece arm design used to separate the bare arms from the shirt sleeves. Once attached his arms kind of resemble Popeye's forearms. 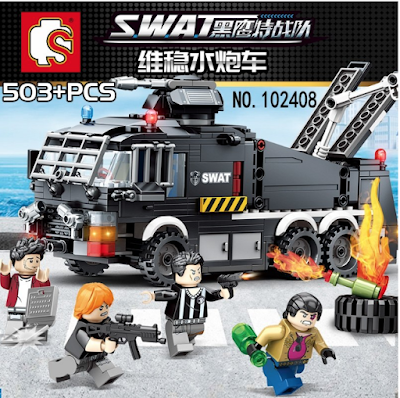 Unfortunately this unique design doesn't afford any extra mobility or flexibility on the arms like the Xingbao style minifigures. Ok, time to build this thing. As I mentioned earlier, the brick parts aren't sorted in any order amongst the 12 bags, so I had to rip them all open to get at everything. Upon checking out the block pieces, I found them to be very similar to Megablox, so they are not as good as Lepin. There were a lot of the pieces were scratched and the clear window/windshield pieces were dull and cloudy. Here's a couple of pictures during the construction. It immediately became clear that this vehicle was massive. It's in a much larger scale as other Lego type vehicles. I can pretty much say this truck is original in design and not bootlegged from any existing or retired Lego set. And here's the completed truck riding on it's oversized tires. It's got a mad max sort of vibe going for it, with the bars on the front and side. The beige gear on the right side of the truck controls the rotation of the turret on top. Although there's ample storage boxes located on the truck, six of them, there weren't any extra accessories to go into them. This is the front view of the truck. There's two water guns attached to the front. The only missing piece I encountered is on the front grill. I only got 3 pieces instead of 4. I've got a spare one in my stash, so not a big deal. The truck is equipped with side mirrors and windshield wipers. Despite it's large size, the truck only has room for 2 minifigures. The cab has opening doors, but it's not easier to place the minifigures through them. It's easier to take off the roof panel for egress. The water guns on top of the turret both pivot up and down. Here's a top view of the Water Cannon truck. When not in use the extendable water gun tucks neatly into the back of the truck. To get at the water gun, you flip up the two panels. The water gun can be extended and rotated 360 degrees. When not blasting down anti-government demonstrators, the water cannon truck can also be used for fighting fires. Almost forgot to mention that in the back of the truck, there is a panel that be opened to access 2 black fire extinguishers (not very noticeable due to their colour). Here's a look at the accessories and spare parts that came with the set. Oy, yet another brick separator tool to add to my ever growing collection. As always, I didn't apply any of the stickers that came with the set. The truck rolls well and is quite sturdy. Added to the fact it has a lot of play value, this truck would make a nice addition to anyone's brick collection. The only cons of this set is that some of the brick pieces are scratched and the windows are dull. The minifigure printing is very high quality. Thanks for looking, see you next time! This is a reminder that unauthorized use and/or duplication of the material without express and written permission from this site’s author and/or owner is strictly prohibited. I Bought Lepin 15039 Roller Coaster From Shenzhen! 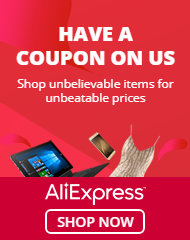 My Aliexpress Account got Suspended!